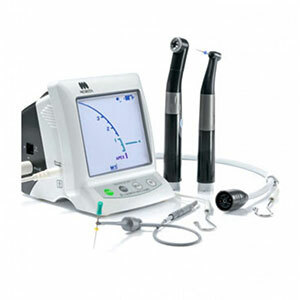 Unique module system that includes apex locator and handpieces for canal preparation as well as optional handpiece for light-curing functions. Several automatic control functions ensure safe and comfortable treatment. An optional upgrade, The OTR Module, is available with the Root ZX II. The OTR Module enables the unit to function as a low-speed handpiece, an apex locator and as a combination of both. This makes it the perfect endodontic solution to carry out root canal procedures. The OTR Module snaps easily onto the unit and offers a unique 90-degree auto torque reverse and file advancement feature. It ensures excellent cutting efficiency with lesser stress on the rotary file, which reduces the chances of file separation and instrument fracture. The use of Root ZX II is indicated in determination of the working length while carrying out endodontic treatment. Large Colour LCD Screen: With its large LCD colour display, the Root ZX II apex locator gives high contrast with clear progressive display. Auto calibration: With the Root ZX II apex locator, any changes affected by moisture, temperature etc inside the canal can be eliminated while ensuring accuracy, even while treatment is in progress. No-Zero Adjustment: The apex locator works perfectly fine even without setting the readings to 0 before measurement of any individual canal. 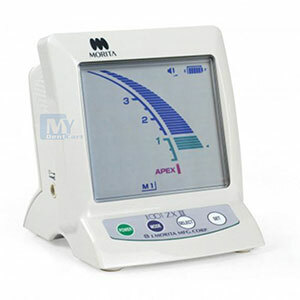 Accurate measurement: With Morita Root ZX II apex locator’s ratio technique, file’s location can be detected to a high level of accuracy. This measurement accuracy is unaffected by absence or presence of blood, hydrogen peroxide, tap water, saline, electrolytes or other discharges. Manufacturer/Importer warranty of 1 year as applicable for this product. Service and Warranty; are handled by the manufacturer/importer directly for this product. MyDentCart will not be liable to replace the Products and the liability to replace any such Product is that of the Manufacturer/Importer. MyDentCart and the Buyer acknowledge that the Products purchased/used are a subject matter of original Manufacturer/Importer’s warranties only. Any or all claims in relation to returns and replacement shall be made to the concerned. Manufacturer/Importer only and MyDentCart may assist the customer in registering a request to get the Product replaced or serviced. The Buyer acknowledges that the Products once sold will not be exchanged or taken back unless the seal of the package or the Product is intact or not altered in any manner or is not tampered as the case may be.